Read more about Expelled from South Moravia: Refugees (Not) Welcome! Edvard Beneš is said to have contributed to the state. But what state? Only a few figures in modern Czech history arouse such controversies as the second President of Czechoslovakia. Some see him as a co-founder of the state, a liberator and the first victim of the Bolsheviks. Others consider him a Masaryk's pale shadow, an after-Munich* and pre-February** coward, and implicitly a perpetrator of genocide. And who knows, maybe all these views are valid to an equal measure. Read more about Where does it come from? In Brno the Warsaw Pact invasion of August 1968 led to the loss of several lives. And people also died in the protests that marked the anniversary of the invasion a year later. On Sunday August 23, 2015, a commemorative gathering took place as part of the Year of Reconciliation at the site of the concentration camp in Hodonín (near Kunštát), in remembrance of the largest transport to leave there for Auschwitz, on August 21, 1943. The event took place on a building site among bulldozers and trucks since after the closure of the recreational facility a memorial is finally being built. Whatever the genocide or war we consider in modern times, the perpetrators of even the most heinous crimes mostly escape justice. Why is this? While the GDR (East Germany), just like Czechoslovakia, did not allow open discussion, the Federal Republic of Germany (West Germany) went through an unprecedented process of reflection and repentance. Despite this, or perhaps rather because of this, it is shocking that of the approximately six and a half thousand guards who served in the Auschwitz concentration camp, only some forty-three were brought before the courts in West Germany. It was only this year that the “Auschwitz Accountant” Oskar Gröning found himself on the defendant’s bench. Post-War Germany: The Nazis are Weeded Out! 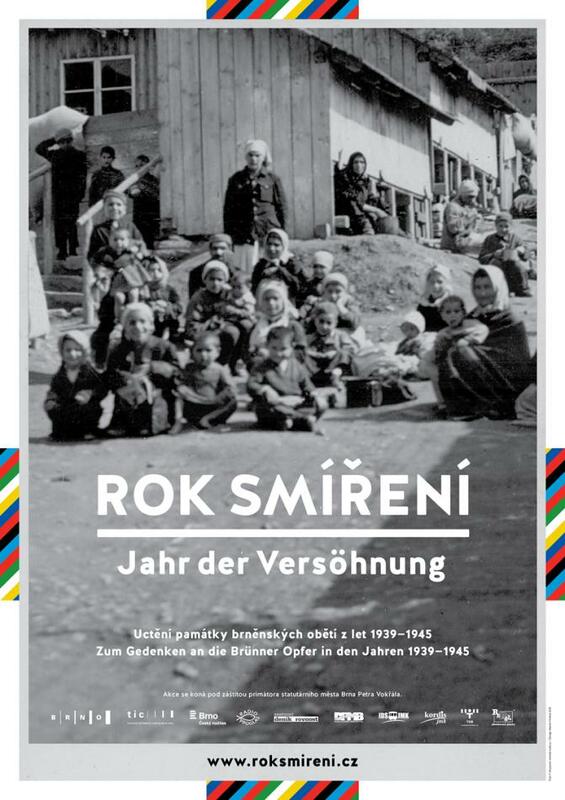 Mainly as a result of the rise of communism in Czechoslovakia the punishment of the perpetrators of the Romani Holocaust and the excesses accompanying the expulsion of the German-speaking population essentially did not happen. What happened to Nazi criminals in Germany? Read more about Post-War Germany: The Nazis are Weeded Out! On the north-west edge of what is now Moravské Square but was then Lažanské Square stood the Deutsches Haus (German House), a building that inspired admiration and hatred. Its destruction marked the end of the coexistence of the two nationalities in Brno. "Beautiful. This is what I call dealing with the past," a post says in the discussion under the Pilgrimage of Reconciliation coverage on the website of the prestigious Austrian daily Der Standard. On a similar note are most of readers' comments under the interview with the organizer of the Pilgrimage of Reconciliation, which Der Standard published on the day of the event. Patriots of opportunism. Who were the people who expelled others from Brno? Violence against German-speaking inhabitants broke out immediately after the war front swept through Brno. The shocking scenes took place in the streets and especially in internment camps all around the city; the culmination of these excesses, however, was the Death March, which began on 30 May 1945. It was ordered by the Brno National Committee, where Communists played a leading role. The so-called Košice Program of the National Front, an association of the only permitted political parties in the post-war Czechoslovakia, imposed their equitable representation in national committees, but the Communists in the Brno National Committee – contrarily to the above mentioned program – occupied as many as twelve seats of thirty. Read more about Patriots of opportunism. Who were the people who expelled others from Brno? No less than three events of the Year of Reconciliation series will be organized this Thursday, 21 May, by Jiří Mahen Library. At 5 pm you can listen to author's reading from the novel The Expulsion of Gerta Schnirch by Kateřina Tučková. The book and its adaptation by Feste Theatre and HaDivadlo has largely contributed to raising the awareness of post-war violence in Brno. The novel won the Magnesia Litera Readers' Prize in 2010 and was also nominated for the Magnesia Litera Prize for Prose, Josef Škvorecký Prize and Jiří Orten Prize. President Beneš in Brno: "Eradicate once and for all"
Read more about President Beneš in Brno: "Eradicate once and for all"